Europe's Mars Express orbiter captured this image of a half-lit Red Planet in December 2012. Some answers may soon be on the horizon, because that June 2013 detection has just been firmed up. 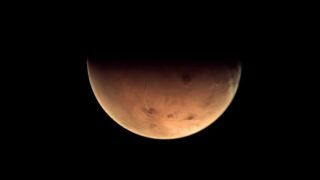 Europe's Mars Express orbiter noted the spike as well from that spacecraft's perch high above the Red Planet, a new study reports. "While previous observations, including that of Curiosity, have been debated, this first independent confirmation of a methane spike increases confidence in the detections," said study lead author Marco Giuranna, of the Istituto Nazionale di Astrofisica in Rome. And that's not all. Giuranna and his team also traced the likely source of the June 2013 plume to a geologically complex region about 310 miles (500 kilometers) east of Gale Crater. Giuranna, the PFS principal investigator, had prepared for synergy with the Curiosity team. Soon after the rover's August 2012 touchdown inside Gale, he decided to monitor the air above the crater over the long term, Giuranna said. So, Giuranna and his colleagues developed a new approach to PFS data selection, processing and analysis. For the new study, they applied this approach to measurements made over Gale Crater during the first 20 months of Curiosity's mission on Mars. "We were very lucky, as this is not the result of coordinated observations," Giuranna told Space.com via email. "Just by chance!" By the way, background methane levels in Gale Crater's air, as measured by Curiosity, range from about 0.24 ppb to 0.65 ppb. The study team also homed in on the methane plume's possible source region, using two independent approaches. "Remarkably, we saw that the atmospheric simulation and geological assessment, performed independently of each other, suggested the same region of provenance of the methane, which is situated about 500 km east of Gale," Giuranna said. "This is very exciting and largely unexpected." "That methane could be released episodically along faults that break through the permafrost due to partial melting of ice, gas pressure buildup induced by gas accumulation during migration, or stresses due to planetary adjustments or local meteorite impact," the researchers wrote in the new study, which was published online today (April 1) in the journal Nature Geoscience. The paper doesn't address the ultimate origin of the methane — whether it was churned out by Martian microbes or reactions involving hot water and certain types of rock. And scientists don't know if the detected methane was produced recently or long ago; it could have been trapped under the ice for eons, after all. Indeed, Giuranna's team is involved with the TGO mission, which arrived at Mars in October 2016. And coordinated TGO-Mars Express measurements are in the works. The PFS team also aims to apply its new analysis techniques to the instrument's entire data set, Giuranna said. "Follow-up is very important to better understand methane on Mars," he said. "We are collecting pieces of a puzzle and need more pieces to understand better what is going on."